Wildlife - A pair of dolphins swimming in a pool. A pair of dolphins swimming in a pool. A pair of dolphins surface for a lazy look around the pool. Bottlenose Dolphins Bottlenose dolphins (Tursiops truncatus) is the most common dolphin species and may be found worldwide with the exception of the Arctic and the Antarctic Ocean. The elongated upper and lower jaws give the animals their name of Bottlenose- the real nose is the blowhole on the top of their head. They live together in groups called pods which contain up to 12 animals. Pods are known to join temporarily to form larger groups called herds or aggregations. Bottlenose dolphins are 8-12 feet long and their tails have two horizontal paddles called "flukes" which contain no bone or muscles and helps power them through the water. Their typical speed is 3-6 mph, but can reach 21 mph for short periods. 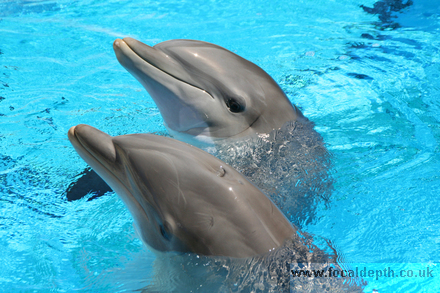 Dolphins have to rise to the surface every 5-8 minutes to breathe. Their diet consists mainly of small fish and their peg like teeth are used to grasp food, but not chew it.